The first of our book recommendations, The World of Muriel Brandolini Interiors, was recently given to our creative director as a birthday gift. 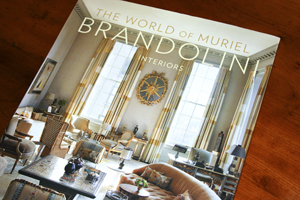 While familiar with interior designer Muriel Bandolini’s work, we had not had the pleasure of perusing this well written, beautifully photographed, and truly inspiring book. We quickly realized that it would make the top of our recommendation list; it is not only filled with jaw dropping interiors that infuse bold juxtapositions of color, texture, pattern, and periods, just what Muriel is famous for, but it highlights the sumptuous walls that set her unconventionally elegant stages. 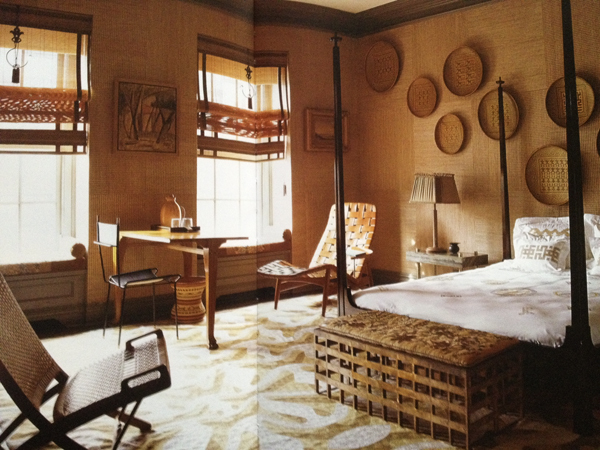 An upstairs bedroom in Brandolini's Long Island home's guest house. The space feels welcoming and secluded with walls and ceiling of matching patterned fabric. 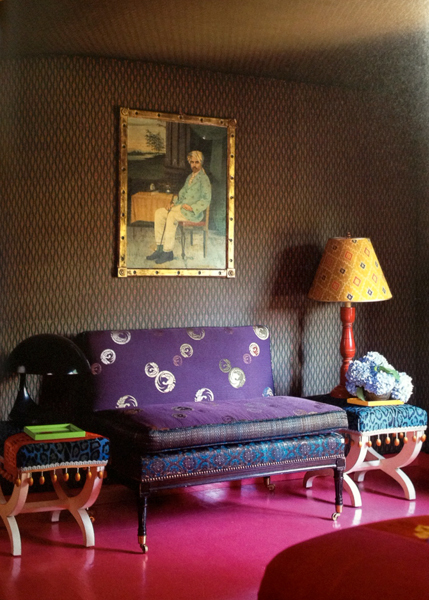 The bright magenta high gloss wooden floor plays off the walls and lends a glamorous edge. On the Park in New York City, this bedroom has walls covered with squares of straw randomly rotated and adorned with handmade baskets from the Amazon. 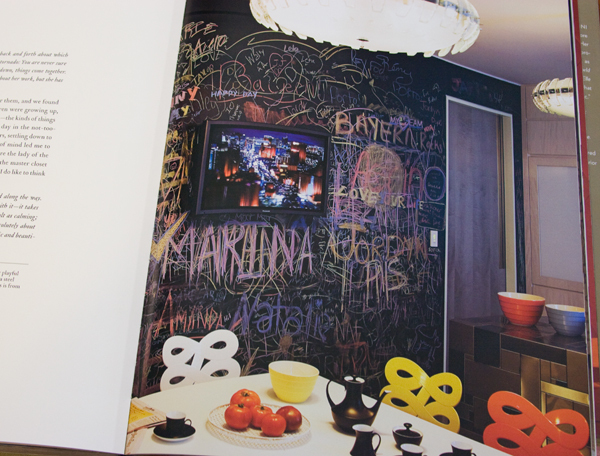 Page after page illustrates Muriel’s unique style and flair for creating walls that are so much more than a backdrop. Never one to use wallpaper- she finds it “cold”- she embraces fabric instead and much of it is custom and embroidered or beaded. She has been known to use clients’ lives as inspirations for these creations, with words as pattern that are derived directly from their experiences. 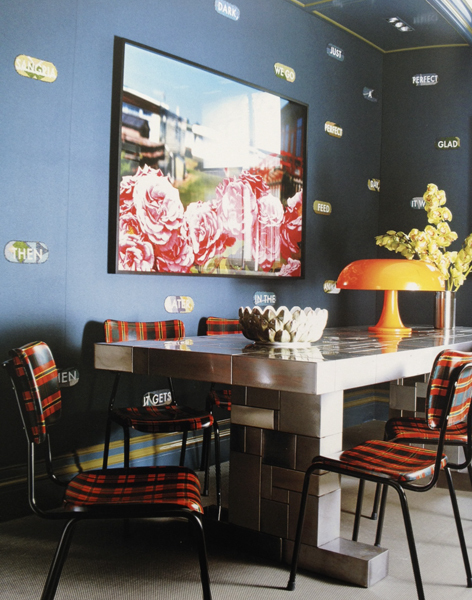 1960's plaid chairs from Italy embrace a steel table by Piet Hein Eek in this refreshing kitchen. 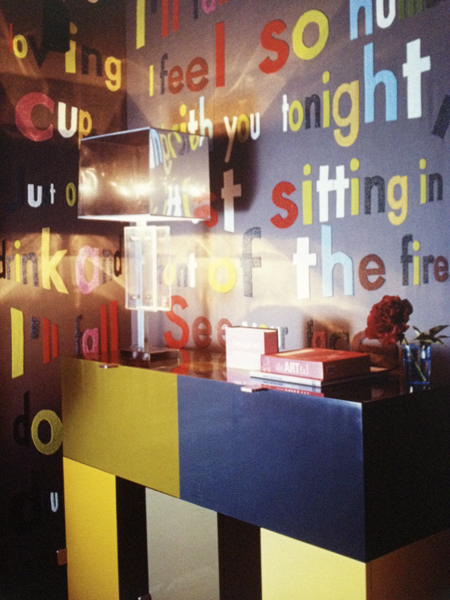 The walls wear Holland & Sherry felt that is beaded with patterned happy "pills", each bearing a word from Lou Reed's "Perfect Day". More like a perfect kitchen! Detail of bespoke felt wall covering hand beaded in Vietnam. In the book, Muriel’s musings on her relationships with her clients, her inspirations, life, and creative practice are ingeniously interspersed with clients’ reflections of the process. The presentation of the designer’s thoughts followed directly by her clients’, is such an apt metaphor for the work and process, and more importantly for the final outcome. Each informs the other: client and visionary, lives lived and lives envisioned. Layer upon layer, a rich amalgam is revealed. 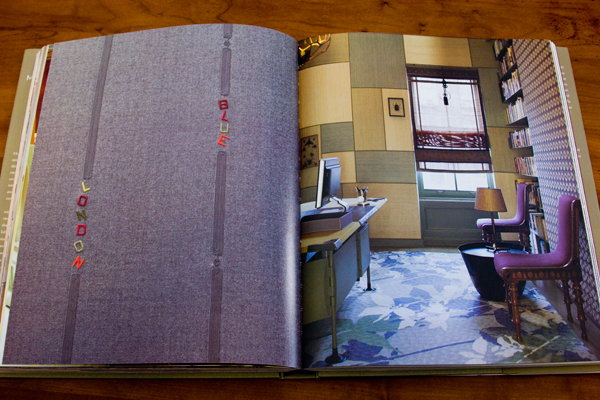 On the left, a wall covering with words from the owner's life are embroided onto a warm gray felt. On the right: an office with a hand-beaded circle design wall panel. The well used chalkboard wall in this playful kitchen is the perfect juxtaposition for the 1950's chandeliers, custom stainless steel island, and Gino Carallo dining chairs. 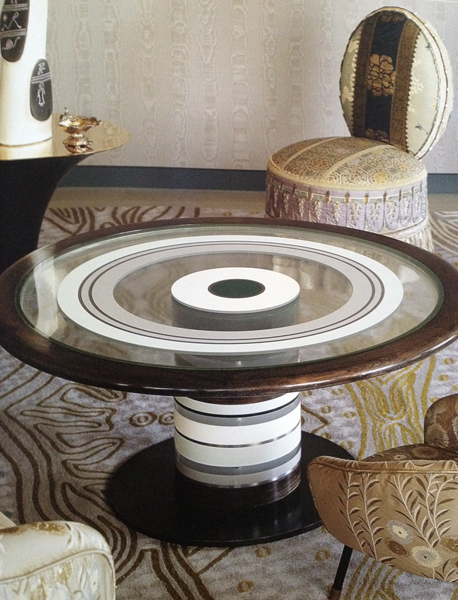 A chair by Brandolini is accompanied by a "ring" coffee table by City Joinery. The walls in this home were "built to a size that would match the wall coverings" creating a seamless visual experience. 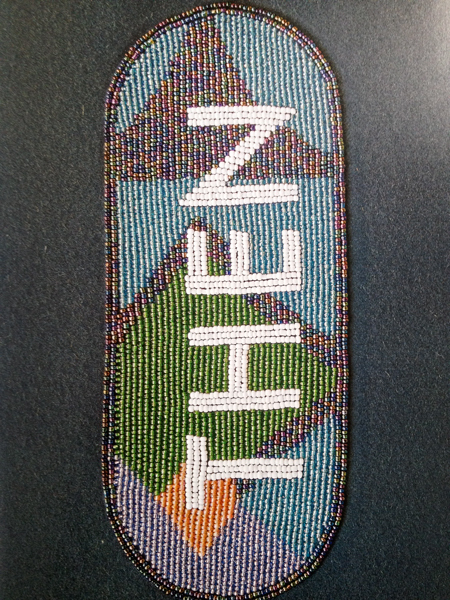 Signature style: custom beaded fabric bejewels this entry's walls with the lyrics from her clients' favorite Rolling Stones song. 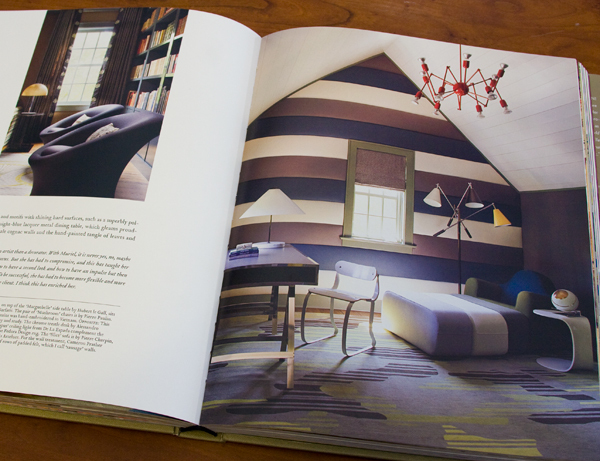 In a room meant for "both play and study" the designer along with Cameron Prather created a striped wall treatment consisting of padded felt rows. She calls them "sausage walls". We call them fantastic! At SuperStrata we are all about great walls: yours, ours, and their’s; so while we create cutting edge plaster and paint wall finishes, this is the place where we champion the amazing walls that we find around us.